I am a huge fan of family traditions, and Christmas is one of my favorite holidays because it is crammed with them. Besides making the holidays memorable, traditions also make great family friendly party themes! Who doesn't love decorating sugar cookies, or going caroling with friends? Just add some eggnog, hot chocolate, or both, and you have yourself the perfect holiday gathering. You don't even have to plan decorations, because you probably already have your house decked out for Christmas. My mother-in-law has hosted a gingerbread decorating party for over a decade. She provides the houses and the frosting, and each guest is asked to bring candy to share, sort of like a sugar-filled potluck! You can leave it up to your guests to bring the candy of their choice, or you cam make assignments so you have a good variety of sugary supplies. This year we took a page from my mother-in-law's book and planned a gingerbread decorating party of our own. 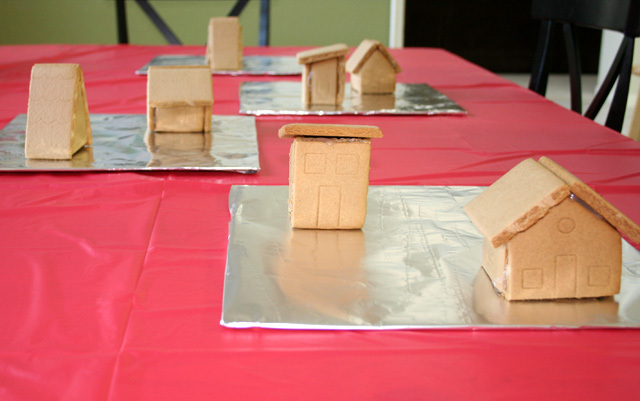 Step one is to make the gingerbread houses. I took the easy way out and bought kits instead of baking the gingerbread from scratch. The kits are everywhere this time of year. I have seen them at my local grocery store, the big box stores, and craft stores. Craft stores usually have a 40 percent off coupon, so if you start planning early enough you can get all of the houses you need at a decent price. And if you plan to make this an annual tradition (and you have enough room to store them) you can buy gingerbread house kits after Christmas at a huge discount. There are plenty of inexpensive options if you want to invite more people, but don't have the budget for more houses. You can give each family one house to decorate together. You can also keep younger kids busy decorating gingerbread boys and girls or, my favorite, turning ice cream cones into Christmas trees. You can always construct houses out of graham crackers too. Once you have decided what material to build your houses out of, it is time to assemble them. 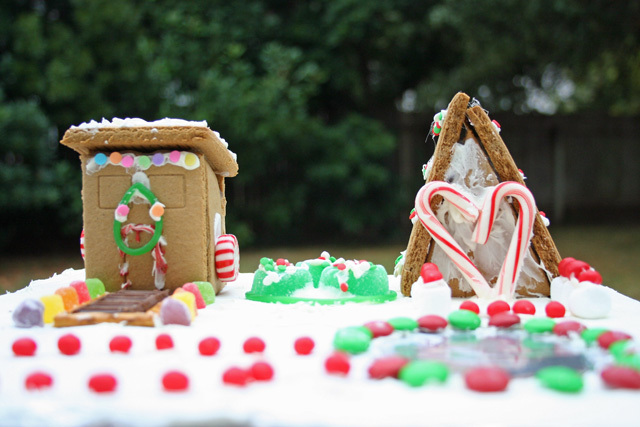 The instructions will likely tell you to assemble your gingerbread houses with frosting, but frosting doesn't always hold up well, and can take a long time to set. If you want to be serious about your houses staying together all holiday season, using melted sugar as the mortar will definitely do the trick. I personally am afraid of melted sugar. The potential for serious burns is too high. Our houses are intended to be 100 percent decorative, so I use a hot glue gun. Assembly with a glue gun is easy, mess free, and quick, three things that come in handy around Christmastime. I like decorating the houses, but I especially love creating a yard around my house. A piece of cardboard wrapped in tin foil will give everyone a nice base for decorating an outdoor space. We have seen everything from skating rinks to outhouses constructed there. Speaking of space, make sure to set up enough tables to give everyone lots of room to be creative. Cover the tables with inexpensive plastic tablecloths so that cleanup will be quick and painless too! Have bowls already set out for the candy and a lot of frosting ready. You can just use plastic knives, but I recommend some disposable piping bags if you have any serious gingerbread house decorators. Each of the kits I bought came with two. Now all that is left to do is have fun and enjoy your guests! Lots of good company and sugar should leave your guests full of Christmas cheer. Their decorated gingerbread houses could easily pass as their party favors, but if you want a simple treat to send home with them, make a batch of vanilla Christmas popcorn. Microwave your popcorn and empty it into a mixing bowl. Make sure no un-popped kernels are in the bowl. Pour melted candy coating over popcorn and fold in. 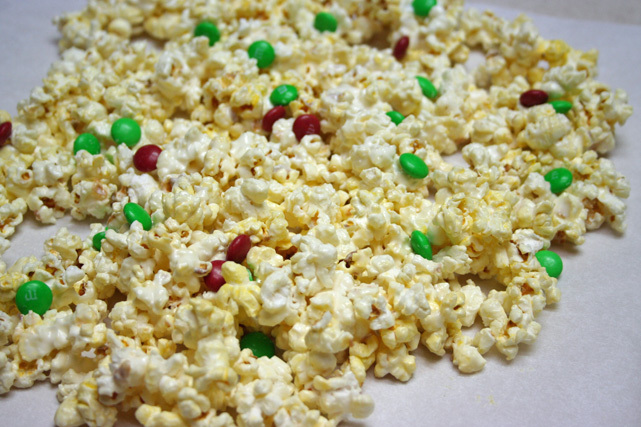 Spread candy-covered popcorn out on parchment paper and sprinkle with candy coated chocolates or holiday sprinkles. Let cool. 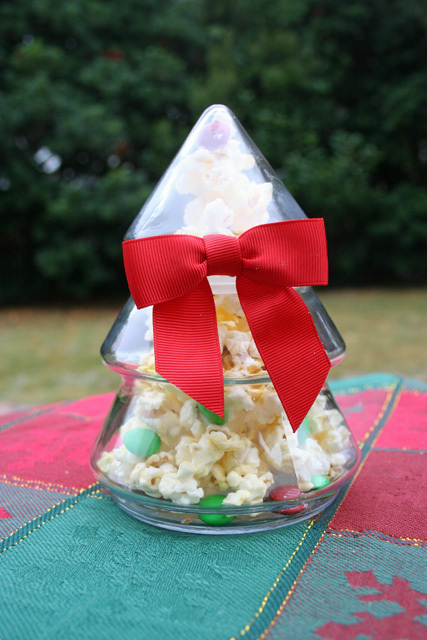 Break popcorn into small chunks and put in a cut bag or Christmas jar. Happy gingerbread house decorating and Merry Christmas! This post is part of BlogHer's Holiday Parties editorial series, made possible by Cracker Barrel. 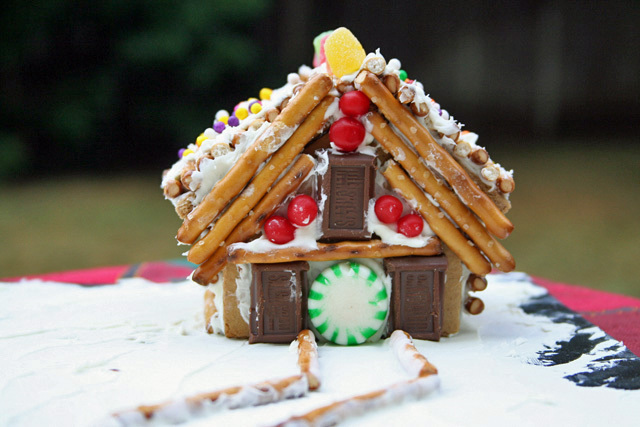 A gingerbread house making party? What a cute and fun idea. I love the popcorn idea too. Looks yummy!